We all know who Natsume is, correct? It's a Japanese gaming company who makes cute farming games where you can raise cows, get married, and have kids. Every now and again, the developers put a fantasy spin on the whole affair, and everyone has a good time. In recent years, there isn't anything to suggest that this company has a violent bone in its body, but Natsume hasn't always been the angel it is perceived as today. Back in the NES days, it was the maker of an interesting string of violent NES action games that were mostly knock-offs of Capcom, Konami, and Tecmo's greatest hits. Shadow of the Ninja mirrored Ninja Gaiden. Dragon Fighter was a Castlevania clone all the way down to its music. Abadox turned out to be even more creepy and gruesome than the Gradius and LifeForce games it took inspiration from. 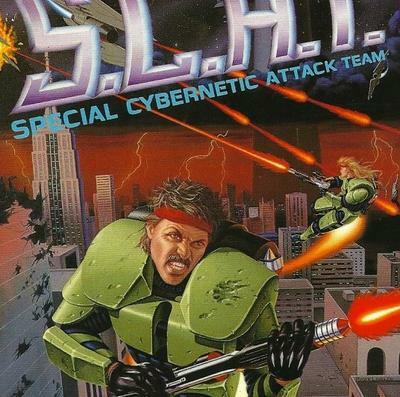 Of all of these clone games, the one which is most memorable is S.C.A.T. : Special Cybernetic Attack Team, a game which completely rips off Capcom's forgotten arcade gem, Forgotten Worlds. I think it's safe to assume the names of these games give a good clue as to why, but Natsume's S.C.A.T. : Special Cybernetic Attack Team has surpassed the source of its inspiration throughout the annals of time in ways that its other clones have not. Not that it is a great game or anything, but it is relevant this week because Natsume is dropping it on Virtual Console for the Nintendo 3DS and Wii U today, Jan 22. I will say one thing, it does have a rockin' chiptunes soundtrack. I would say check it out, but it's far more interesting as a single entry in the overall library of Natsume's NES line-up. It is one of many clear-cut examples of how it tried to play with the big contenders of the 8-bit age but was never quite able to, and that's probably why Natsume is best known for Harvest Moon these days. In fact, the best games of the bunch are the closest Natsume came to making original ideas, Power Blade and Shatterhand. If I were you, I would buy S.C.A.T. : Special Cybernetic Attack Team to show Natsume that its NES classics do have a place in the modern world.